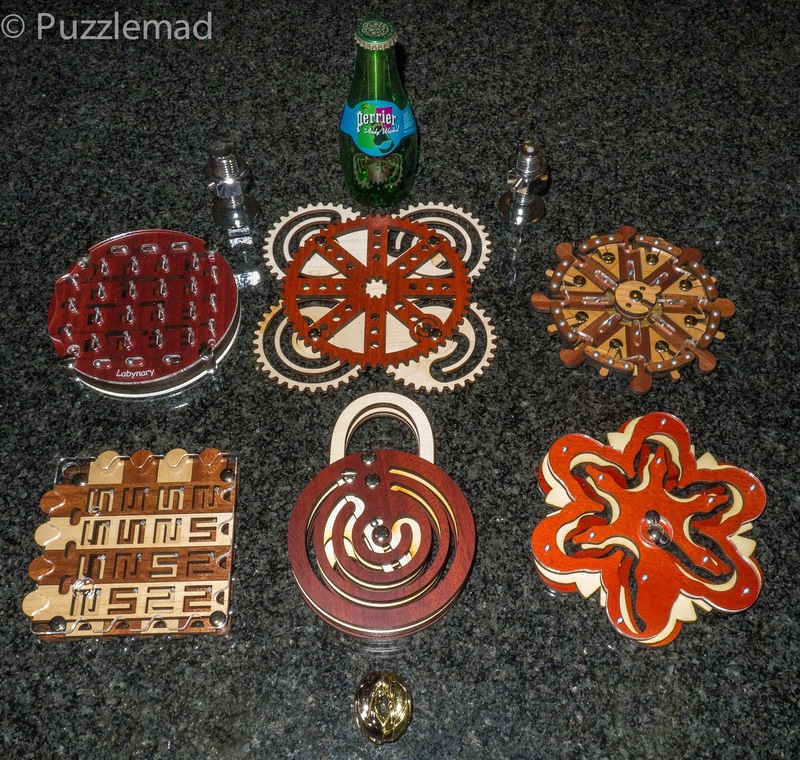 PuzzleMad: Four Deliveries in one week! Is that bad? It will be dry bread and water only after buying these! I'm sorry that this is late - unfortunately I had to work today and not only did it interfere with my puzzling, it also delayed me writing this blog post! Dreadful! Only another 19 years to retirement - sigh!!! I think it was in November that two of the great puzzle collectors in Europe (Goetz Schwandtner and Michel van Ipenburg) both posted news of a few new Jean-Claude Constantin N-ary puzzles about to come up for sale. When I say a few, this is a small understatement! There were 6!! And they all looked beautiful - very finely detailed and very unusual shapes instead of the more usual linear ones I have seen so far. Well you know by now how addicted to this particular group I am and I immediately asked my puzzle pusher, Wil Strijbos, whether he was getting them in stock! Very soon afterwards his news letter arrived with all of them available and maybe one or two other goodies too! After a short gulp at the a sheer cost, I decided that Xmas was coming and Mrs S was going to be getting them for me for my Xmas present! What I hadn't realised was that Mrs S had already bought herself several pairs of shoes and boots for her Xmas present and was eagerly awaiting the Mulberry sale for handbags! I'm afraid that it will be dry bread and water for the next few months to pay for it all - I will of course, still be buying puzzles but not food - I must get my priorities right!! Shortly after my very fast reply to the Newsletter, Wil also mentioned some extras that he had available, the Cast Twist came into stock, 2 more of his fabulous bolts also sort of got added to the list. Poor Mrs S didn't know quite how extensive the order was! But it was on a "need to know basis" and she really didn't for her own good!! Now Wil was hoping to get them out before Xmas but with all of his travelling and issues with stock it just never happened. I had plenty of other toys to occupy me and just waited. This week they arrived - Mrs S was very surprised at the size of the box and even more surprised at how much was inside (the extra was a replacement for the Perrier bottle #2 which had been broken in the mail). These N-ary puzzles will be reviewed in the future. Errrm! A little confession! The parcel from Wil was not the only one to arrive last week! For some reason things that were requested/ordered many many weeks ago all arrived at once! Mrs S has lashed me with the "cat o'nine tails" tongue and burned me with the laser stare because I had forced her to embarrassingly answer the door to postie (we are on first name terms) 4 times in a single week!! Having really enjoyed the original crazy cubes in 2012, and having missed out on the dodecahedral versions, I finally decided to jump in - they are almost entirely sold out but I did find at Champion's store in China they had 2 of the Neptune versions (there are 8 in the series) and using these I can make the whole series! These were ordered in early November after my birthday and have taken 10 weeks to arrive - not Champion's fault but I will never rely on China post again! Next up I received something awesome from a new cube store, Cubezz.com - Rline from twisty puzzles has mentioned these guys quite a bit and I couldn't help perusing their store. They seem to have a very extensive stock and extremely good prices. I decided to check them out and one of my parcels was amongst the three. 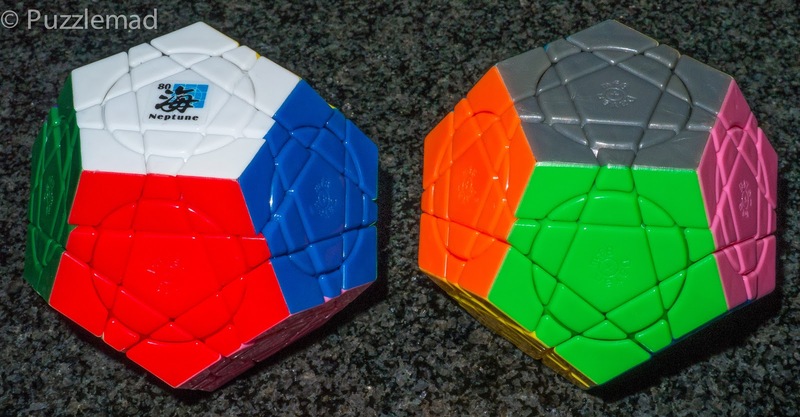 The rhombic dodecahedra are the Moyu Evil Eye I & II puzzles and just count the cubies on the big one! YES!!! It's a 10x10 cube. I will be reviewing it in another post but if you want an even order challenge and you want the biggest there is then that is it. It's huge! Finally, I received something else that I had placed an order for in November. 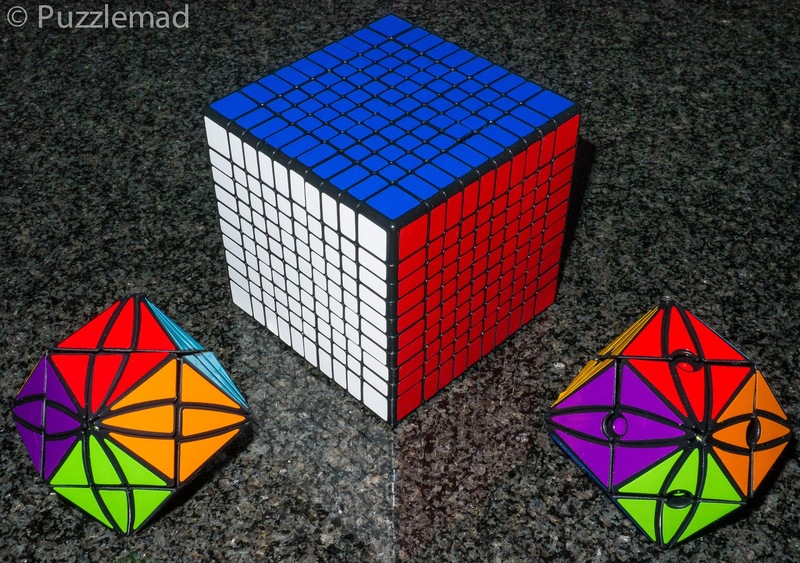 Many of you are aware that Traiphum is the greatest twisty puzzle modder in the world - and about 3 months ago he emailed partly to show off and also because he thought I might be interested. He has produced something truly amazing. 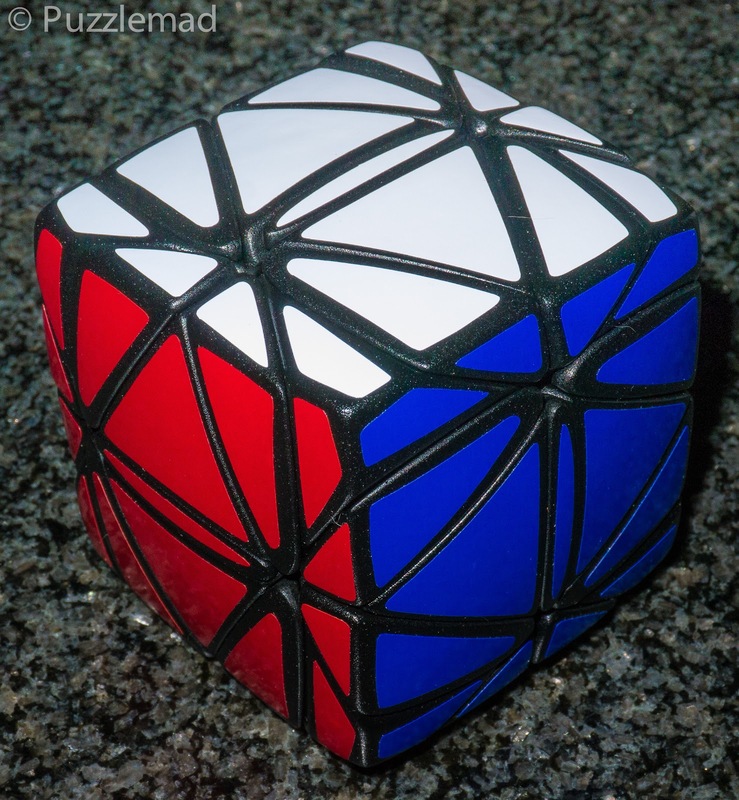 Previously I showed you that he had taken a megaminx (a shallow cut face turning dodecahedral twisty puzzle) and built it out into a cube and named it the Hexaminx. This has subsequently been mass produced and has been very well thought of. Well not to be outdone he has made 4 copies of a new dodecahedral puzzle and done the same thing. The pyraminx crystal is a great fun deep cut face turning dodecahedron and when converted to cube shape become nothing short of mind boggling and VERY beautiful! So first up from this impressive hoard I am going to review the Cast Twist. I got mine from Wil Strijbos but it is also available from all the usual puzzle outlets including Puzzle Master. It is the latest in the Hanayama group of puzzles. Designed by Oskar van Deventer, it consists of two interlocking U shapes which are held together into a sort of ball. The puzzle has been rated as a level 4 out of 6 by Hanayama and a level 8 (Demanding) on the 5-10 point Puzzle Master scale. 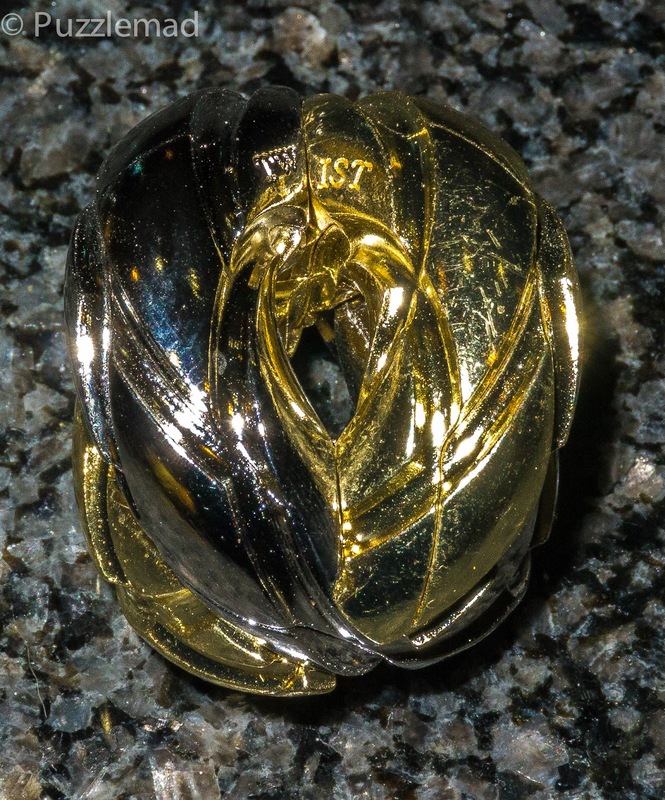 Oskar published an article in the last edition of the CFF about how he designed it and Hanayama manufactured it - he is hosting a pdf version here on his site. No solution is provided but it can be downloaded from here. The aim is to separate them and then, of course, put them back together again. It is made complex by having small protrusions on the inside of both pieces which need to ride along the sinuous grooves cut along the surface of the pieces. This is a similar idea to the simple Cast Keyring or tougher Cast H&H but to me seems like a much more fun idea - the grooves force the pieces to wind in and out of each other very pleasantly. This took me over an hour to solve and there is a certain Aha! moment to discover before you manage it which is very reminiscent of the Keyring. It is lovely and shiny and perfect for any of you magpies out there - you know who you are! At only $13 it's a bargain! Hi! Fellow (Finnish) puzzler-blogger too. To me Twist was a minor disappointment, I felt it went on-rails most of them. While excellent work technically, solving it wasn't that satisfying: I didn't feel I had full control of the solution since I hard could see where the pegs were. I just kept circling it, trying little adjustments and after the one trickier point it was solved. Hi Teemu, thanks for reading and commenting. I agree with you in that you are forced to stick to the rails and that the pegs are awkward to view but I found that they were visible but hard to see the pathway that they would move along. Really this is very similar to the cast H&H. Plus you do need to keep in mind that it is only a level 4 puzzle. For me there is enough different to make it worthwhile and it is VERY cheap!